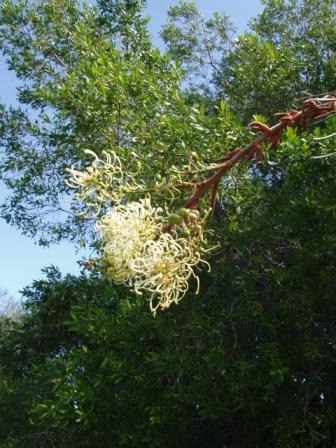 Dense rounded habit with leafless flower stalk shooting above the grey-green foliage. Flowers profusely, with pinkish buds and creamy white flowers. Outstanding in flower. Flowers can have an odor especially at night. Suitable for hot dry sites in sub-tropical to Mediterranean climates. Attracts birds. Great specimen shrub for southern Californian gardens. Propagation Information: Fresh seed germinates readily with pre-treatment of Smoke Plus.